The Raiders are letting this season slip away after winning 11 games in 2016 with just one victory either straight-up or against the spread in their last six outings. Following an encouraging 31-30 upset against Kansas City on Oct. 19 as a three-point home underdog, Oakland tanked on the road at Buffalo this past Sunday in a 34-14 loss as a 1.5-point underdog. The total went OVER closing line in both of those games. Derek Carr threw for 313 yards against the Bills, but he only posted one passing touchdown against two interceptions. The offense also gave up a 40-yard return for a score on a fumble. All told, the Raiders turned the ball over four times in a very sloppy loss. 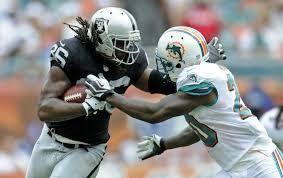 Oakland is now 20th in the NFL in yards per game and 19th in scoring with an average of 21.1 points per game. Defensively, it has fallen to 23rd in points allowed (23.8) and 25th in yards allowed (356.9). Miami is coming off its worst performance of the season in last Thursday’s 40-0 loss to Baltimore as a three-point road underdog. This snapped a SU three-game winning streak to move the Dolphins to 4-3 on the year with a 3-3-1 record ATS. The total has gone OVER closing line in their last two contests after it has stayed UNDER in the first five games this year. The Dolphins had to turn to Matt Moore last week for an injured Jay Cutler and the result of that game speaks for itself. Overall this offense is dead last in the league in scoring with an average of 13.1 points per game. It is also at the bottom of the list in total yards gained with just 252.4 a game. To make matters even worse, this unit has been equally as bad throwing the ball as it has been running it. The only hope for a reversal of fortunes at home this Sunday night is probably a defense that is seventh in the NFL in yards allowed.